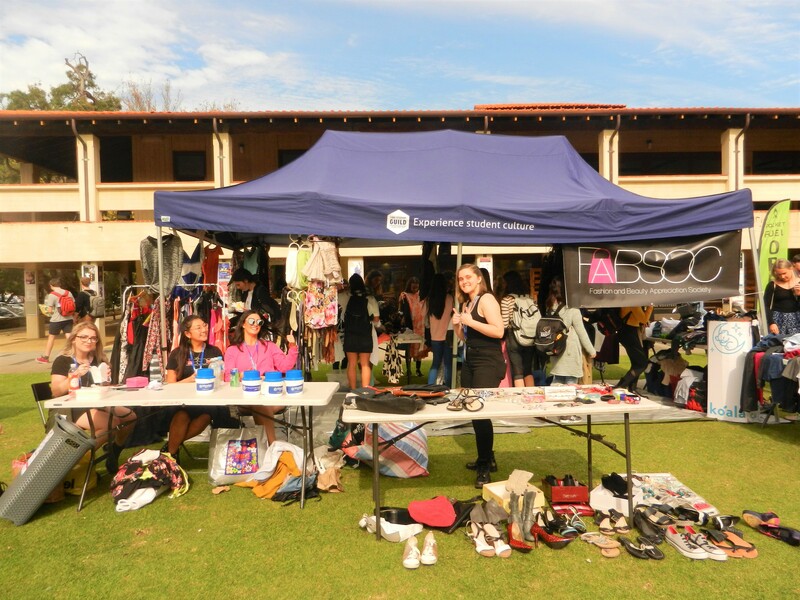 On the 24th of May at Welfare Week’s Clothes Swap or Shop, Pelican interviewed six individuals for their hot takes on the event. Amongst them included Aleasha Sanchez-Lawson, the current president of FABSOC, who ran the event in collaboration with the Guild Welfare Department. If you missed out and need the fun facts, in its essence the event was for the student body by the student body. You would either donate your pre-loved clothes and receive tokens in return to ‘swap’ items, or, ‘shop’ to your heart’s content for the lovely, low cost of a gold coin donation. All the proceeds were given to charity and leftover clothes were donated to Vinnies and Dress for Success. Beautiful. So, how did you find out about this event? MAX// First year psychology and linguistics major. MAX – I saw it come up on Facebook, and I thought it’s pretty rare to have clothing like this so readily available – so I was like sick I’ll definitely get onto that. BASUNDHARA – I know Phoebe, the welfare officer, and I was just coming by and saw this and thought I might as well stop by. VARUN – I found out about it through the guild website and I was excited because I had old clothes I didn’t know what to do with that I could give away. What did you cop today? MAX – I copped a lot of pants like these striped blue ones, checkered [ones], white jeans, denim jeans, some black pants’, and two black long sleeved tees. KATIA – A bag full of clothes, they are amazing! This is an amazing opportunity for people to donate and for people to find things that would otherwise end up in a bin – I love the idea. BASUNDHARA – Nothing yet, I’ve just been helping my friend get stuff – she’s got a jacket and shirt for 2 dollars, which is actually worth 200 bucks – which is amazing. VARUN – Just this one shirt, which I’m not sure will fit me because of the size. What are your thoughts on second-hand fashion and fast fashion? MAX – I definitely find myself keeping up with fast fashion – which is something I’ve been trying to moderate because of the rate you throw things out. I think op- shopping is a great opportunity to find stuff that fits into today’s trends on a much lower budget– like these checkered pants – people can sell something like this for $60 online. LEEANA – I love second-hand fashion – you can find fashion trends that have come back. If you have your own style of course, you’re always in style, whereas with fast fashion things can stop being a trend quickly. BASUNDHARA – I think it’s a great way to reuse clothes – we have so much waste in the fashion industry and it’s a good way to be sustainable. I’m all about that. What’s the second-hand scene like back home? KATIA// Exchange student from Uruguay – International Business. KATIA – It’s like it doesn’t exist [in Uruguay]! There may be some fairs, but the clothes you find there aren’t good at all. That’s why I’m really impressed with the quality and brands here [at the swap]. LEEANA – It is becoming more fashionable right now [in France]. There are two extremes. It either has a poor reputation and is considered, especially with regards to big name thrift stores like Salvation Army, as something for only poor people. On the other extreme it is super hipster, and fashionable second hand items are marked a lot higher. But, as it is now become more normalised we are starting to have things in between. MAX – This is a great event, I found a lot of great stuff – a lot more than I had expected, and I hope that they do this more often. LEEANA – I’m surprised that there are not more people here – but I’m happy because it means more stuff for me! I encourage people to donate their clothes more, it is like giving them a second or third life, and it makes others happy. VARUN – When I came here I noticed there weren’t too many clothes for guys. I actually expected a lot more because I had donated quite a few. I’m a bit disappointed but I’m glad I came by and I could give my clothes. I think these kind of events should be done more often. KATIA – I’m impressed with how well the event is organised – all the sections, I love it very much! Next ArticleCan Western Science continue to ignore Indigenous Science? Help! I’m a broke yet fashionable Uni student, get me out of here!